Cordless office phones have many benefits over traditional desk phones when it comes to business. Depending on the nature of your organization and the size of the office space you operate in, these wireless devices can increase collaboration and also offer flexibility to a communications process that that may be restricted by individual desk handsets for each user. This guide will explore the advantages that are open to businesses looking to adopt cordless office phones for their workforce. As well as breaking down the benefits the best cordless phones available on the market are also reviewed so businesses can ensure they get the right fit for their needs. What Are the Business Benefits of Cordless Phones? One of the main drawbacks of cordless phones in the past was their lack of features and limited functionality in comparison to traditional handsets. Early adopters of cordless phones would often have to make do without an answer machine as the technology just wasn’t available to support the function. This is however no longer the case. As we all know too well, mobile phones have made swift progress in terms of both functionality and their technological capabilities and the same applies to cordless office phones. This means that many of the features you have come to expect from an business phone you can also expect to find in cordless alternatives. These features include caller ID, call forwarding, phone directory and auto dialer to name just a few. These options mean by choosing a cordless phone system you can be sure that you lose no competitive edge in comparison to competitors using other types of systems. You can also be confident that your routine, daily tasks can be carried out with the same efficiency if not more effectively with the added advantages of cordless phones. When compared to mobile phones and even desk handsets, leading cordless phones were found to have superior sound quality. This can be a major advantage to work places where a number of calls are being made at the same time and volume levels can be known to rise, sometimes hindering calls being made if the voice quality isn’t clear enough. The most obvious benefit of cordless phones is the mobility they offer to users. We have all been on calls at one time or another where we find ourselves wanting to roam and wander to raise energy levels or keep concentration, and with cordless phones this is easy to achieve. The flexibility that cordless phones offer mean calls can also be taken and made wherever someone is within an office or workplace. This is particularly useful for large businesses where users may wander some distance from their desks but still need to be contacted or make calls themselves. One of the key advantages of cordless phone systems is that they are extremely easy to expand. If you are part of a growing organization with new hires joining often it is not uncommon to quickly run out of phone handsets or for communications to stall because of a result. With cordless phones, your system can grow quickly with new handsets and docks being added to an existing setup. There are two main types of cordless phones, analog and DECT. DECT stands for Digital Enhanced Cordless Technology, and is a term describing IP phones that are capable of delivering high-quality wireless voice communications to employees who work away from their desks and roam within a building, campus or other work environment. ECO DECT phones incorporate an energy-saving power supply, which uses up to 60% less energy than conventional DECT cordless phones. The handsets receive their signals from one or more base stations, but can only operate within the range of the base station. The 1.9-Ghz frequency band that DECT phone operates within minimizes interference from other every day devices, aiding sound quality and improving the range that handsets can be operated at. The base stations also act as charging devices for the handsets, charging DECT phones quickly and allowing them to improve the length at which they can be used when they aren’t docked. DECT handsets offer important benefits, including high security, scalability, low power consumption and long talk/standby times. Many models include productivity features such as SMS messaging, intuitive menus, graphical displays and telephony features such as hold, conferencing, and messaging. Cordless IP phones connect to a base unit that functions in essentially the same way as a conventional IP desk phone. The base station is connected to a landline or VoIP service. The phone’s ability to work is determined by the operating range of the base station. Wireless IP phones use the business wireless LAN to connect directly to a PBX (private branch exchange) or network router to access the external telephone service. These phones do not require a base unit and this gives them a more flexible operating range. Wireless phones may also be used more commonly to refer to systems such as VoIP headsets which have advantages of their own depending on the sector your business is in. With so many options and even more features, it can be hard to decide which cordless phone is the best. All of those on our list below are great choices, however the Mitel 5614, Yealink W56P, and Cisco 8821 IP Phone stand out for their unmatched mobility, impressively easy to use interface, and durability, respectively. These characteristics, combined with their communication features, make them our best cordless phones for 2019. 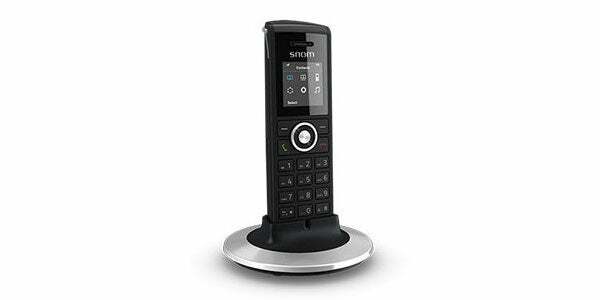 The Mitel 5614 DECT cordless phone is designed for flexibility and and functionality. It comes with a number of programmable soft keys that will allow users to make everyday functions accessible. This cordless phone is particularly great for shift-focused work environments, as it doesn’t always have to charge on a base. It comes with a six-way battery pack charger, so you can swap out dead batteries for fresh ones whenever you need them. If you’re looking for a phone with a little more desktop focus, the Mitel Cordless DECT Handset is a combination of mobility and stability. The huge, high resolution display makes desktop functions easy, and the cordless handset lets you move around as needed. Additionally, the Mitel 632 DECT Phone is the rugged cordless phone you need when things get a bit more hectic than planned. Security and healthcare professionals would particularly enjoy this phone as it meets hygiene requirements, is easy to clean, and comes with sensor alarm features so you don’t accidentally leave it behind- you’ll always be contactable during working hours. Mitel’s handsets are perfect for those communicating across a range of working environments rather than from one traditional fixed desk. With interchangeable batteries, and rugged builds, Mitel phones are an obvious choice for busy teams and hectic offices or work sites. 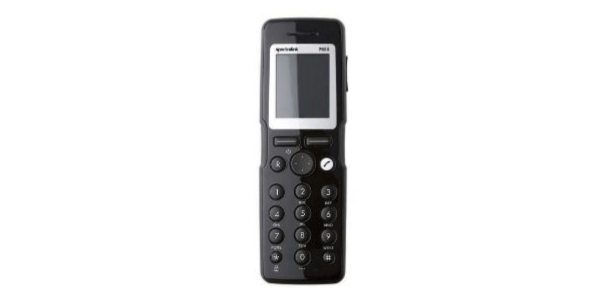 The Yealink W56P DECT phone is a well-designed device for any sized company. Suited best to warehousing, catering, and retailer industries, this cordless phone is not only easy to use, but also easy to deploy across your team, thanks to Yealink’s free Redirection and Provisioning Service. This handy premium cordless phone comes with USB charging, 30 hours of battery life while talking, and an impressive range whether you’re indoors or outdoors. Yealink offers a wide range of DECT phones. Another option is the Yealink W52P, an SIP cordless phone designed for small businesses and home offices that want an affordable, scalable mobile communications system. 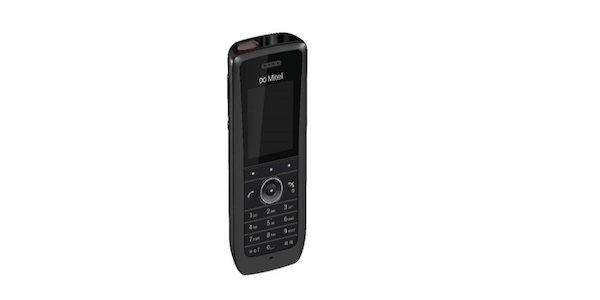 The phone offers fewer premium features, only expands to three handsets, and the battery life isn’t as good, but it still has clear voice communications and features such as intercom, transfer, call forward and conferencing. If you want a more advanced option, the Yealink W60P is the heavy-duty, premium option in Yealink’s lineup. You’ll get the same battery life as the W56P, but you’ll be able to expand to eight additional handsets, which is helpful for larger teams. Besides this however, there’s not a huge difference between the W60P and the W56P, other than the price tag. 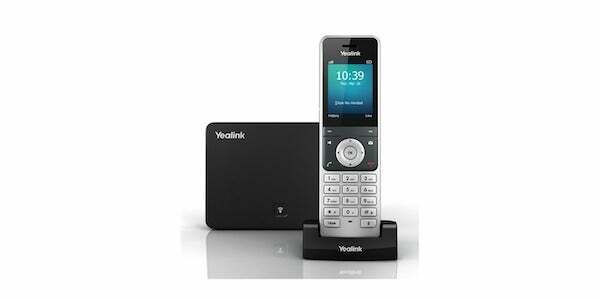 Yealink have phones designed for a wide range of specific needs, so you’ll have no problem finding a great cordless option for your workplace. The long battery life and extended range make them perfect for busy offices, and the reasonable price tag is nothing to scoff at. The Cisco 8821 Wireless IP phone is another device designed for workers on the go. It comes with resilient, sealed exterior, making it certified IP67 from water and dust, and extended-life batteries, so you won’t miss a call during the day. The device is also Bluetooth-enabled, so hands-free calls on the job will be a breeze. As one of the largest provides of technology out there, you know Cisco has a great lineup of IP phones, but a lot of them aren’t cordless. Check out the 7700, 6600, and of course the rest of the 8800 series to get a better idea of what they offer. Cisco does, however, offer an upgrade to the 8821 in the form of the 8821-ex. This ruggedized upgrade ideal for engineers and emergency response personnel adds industry-standard yellow plastics that seal it from dust, dirt, water, and chemicals, and provides a unique yellow color so it’s easy to spot during the work day. When it comes to phones from Cisco, it’s all about durability. Many Cisco devices even have military-standard 810G exterior coating to protect them from falls and drops. These two cordless devices come with premium smartphone level water/elements proofing, so you can take them to any job site, no matter how wet, dusty, or dangerous it might be. The Panasonic KX-TG9582B is a high quality, convenient phone system from a reliable brand. While it only has two lines, it is expandable to twelve headsets to allow your small team to communicate. Plus, with Link2Cell technology, you can sync up to four smartphones to the system to make and receive mobile calls with any of your headsets. The Panasonic KX-TG9582B comes with a lot of standard features, like three-way conferencing, call block for up to 250 numbers, and speed dial for up to 22 contacts. You also get some premium features, like text alerts for your smartphone, and a powerful battery backup so you don’t miss call when the lights go out. If you’re looking for something a bit more affordable, the Panasonic KX-TGF35 is a solid option at a much lower price point. With handy features like baby monitoring, noise reduction, and even a key fob location accessory, you’ll get a cordless phone system with the characteristics you need without breaking the bank. Again, two lines isn’t a lot, and that’s pretty standard across the Panasonic lineup. But if you can get by with two lines (and twelve handsets) you should absolutely consider these options. Panasonic is a trusted brand with the resources to manage customer support issues, and these robust options comes with all the features you’ll need to keep in touch with team members and clients alike. The Spectralink 7522 is a user-friendly, sleekly designed handset that is tried and tested across leading unified communication platforms. This specific device is an upgrade from the Spectralink 7520, as it added 50 extra address book options and larger screen. It also comes with a number of administrative features, like auto-answer and silent mode alerts. Spectralink has a wide range of cordless phones specifically designed for a number of industries and purposes. The Spectralink 7202 is designed for retail, as it’s reliable and durable. The Spectralink 7212 comes with incredible voice quality and customizable third-party apps. The Spectralink 7642 is perfect for manufacturing, as a number of motion alerts are built in for emergency situations. And the list goes on. Spectralink has a different phone for every industry, every necessary feature, and pretty much everything you can imagine. Their extensive list of cordless phones will help you whether you’re a big company or a small startup, a retail business or a manufacturing operation, and anything in between. Ready for some help choosing the perfect cordless phone system for your business? 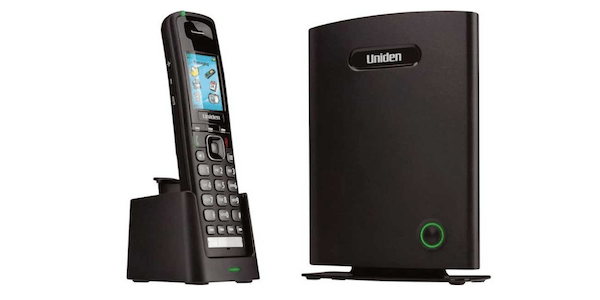 The Uniden EXP1240 phone system is a heavy duty system that can handle up to 200 handsets per network segment. This two-pronged system comes with an EXP1240 Base and EXP1240 Handsets. You need both for the system to function. It comes with features like HD voice clarity, 64-bit digital encryption, and visual ringers. This is a VoIP system, so you’ll be set up over the internet rather than standard phone cables. This also provides easy handover between cell and secure lines, so you won’t need to worry about missing a call. If you’re looking for a heavy-duty cordless phone system that can handle your large team with a lot of lines, this is it. Not only will you get hooked up with a modern VoIP system which has a number of benefits, the plentiful features will make it easy to manage your business communications. The Snom M25 Office Handset is a high-performance and affordable option for your cordless phone needs. With an innovative and intuitive user interface, handling calls and managing contacts will be as easy as pressing a few buttons. Battery life can be pretty bad, but if you only need it for short periods of time, this phone should work out just fine. Snom has more M series devices than you can count. The M15, for example, is perfect for small businesses, as it’s very affordable and covers all the basics of a business’ communication needs. If you need a cordless phone for a larger business, the M65 and the M85 provide the heavy duty battery life and added features you need when managing a big team. The M65 is an upgraded version of the M25, whereas the M85 is the industrial model for rugged work conditions, being waterproof and dust proof. The Snom M series comes with a lot of ups and a few downs. They are incredibly intuitive and easy to use, and you can’t match the price anywhere in the industry. However, they do suffer from poor battery life, which is something to consider. All in all though, their vast selection is worth at least taking a look at if you need a cordless phone. The AT&T TL86109 corded/cordless answering system is a two-line machine that is expandable up to twelve handsets (the AT&T TL86009). The AT&T TL86109 also comes with features like line power mode, five-way conferencing, and multilingual setup options. This advanced system allows you to swap between cellular and business line calls easily, thanks to the Connect to cell feature. This also allows you to connect your phone system and smartphone via Bluetooth, so it will sync immediately. 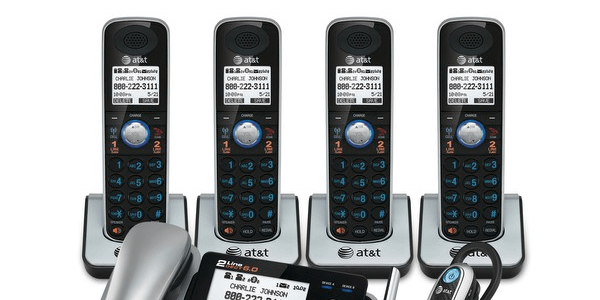 The AT&T TL86109 is an advanced phone system built for cordless use. The main station is corded, which can be a hassle, but setting up handsets is easy because it is compatible with all AT&T headsets. The only issue is that this phone system doesn’t allow you to transfer a cell phone call back to the home system, which can be a hassle. If this isn’t a problem though, it could definitely be the phone system for you. The VTech CM18445 small business system is just that: perfect for small businesses. With four lines and ten expandable stations, you can assign lines and handsets as necessary to your various departments and employees. While the main console is indeed corded, adding cordless handsets is so easy, it had to make it on the list. The CM18445 comes with all the standard calling features, like call recording, remote access, and memo recording, as well as some premier features like an auto attendant on each line to streamline business communication. 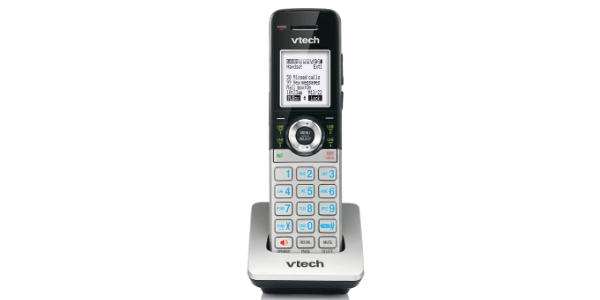 As the largest cordless phone supplier in the world, it’s safe to say VTech has the expertise you need to have a quality communication experience. If you can get past the corded main station, having four lines can help scaling companies grow more smoothly. Plus, at a more affordable price than most, you’ll save resources for other initiatives. 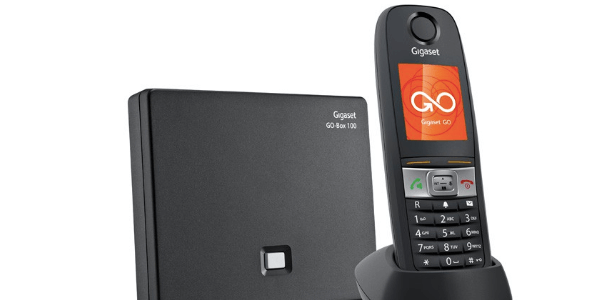 The Gigaset E630A GO is a versatile phone built for busy workers. Whether you’re indoors or outdoors, at the office or in your home, this device comes with specified profiles depending on what you’re up to. Plus, with IP65 certification, it is resistant to drops, water, and dust. 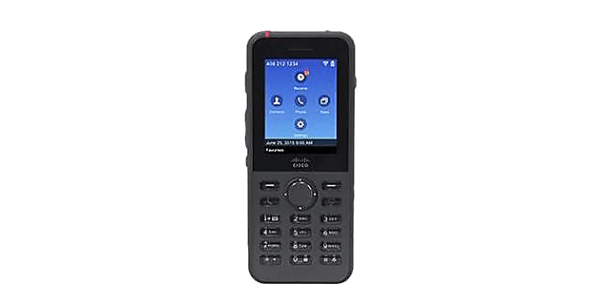 The Gigaset E630A GO also comes with a number of other features, like vibrating alerts and visual notifications, so you won’t miss a call when the job site gets loud. The GigasetE630A GO is perfect for louder, outdoor work environments. It’s durable, it’s customizable, and it comes with smartphone-like features, such as vibrating alerts, visual notifications, and a flashlight. This makes it the easy, convenient choice for any noisy job site. Have you found the best phones provider for your business? Compare your options with Tech.co's free tool.